Shin pain can occur suddenly, but usually develops gradually over time from a range of causes. Shin splints is a common term used to describe shin pain. 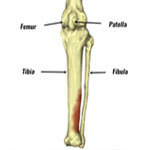 However, this is a general term to describe pain on the inside of the shin, of which there can be a number of causes. Shin splints are the name most commonly used to describe gradual onset pain at the front and inside of the lower leg. But although the term is widely used, it is not a specific injury, more a general term to describe the pain of which there are a number of causes. Medial tibial stress syndrome is the most common injury linked to shin splints and is inflammation of the periosteum (sheath surrounding the bone). 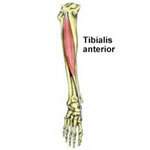 Symptoms include gradual onset pain on the inside of the lower part of the tibia (shin bone). The area will feel tender to touch with possible swelling or redness over the area. Lumps and bumps may be felt along the surface of the bone where new bone growth has occurred, especially if it is a long-term chronic injury. Initial treatment involves rest and applying cold therapy to reduce pain and inflammation. A simple shin taping technique can help protect the area and relieve shin pain. Identifying and correcting training errors, footwear or biomechanical problems are important. Once pain allows, a gradual return to full fitness with a progressive rehabilitation program consisting of stretching exercises and massage can be done. Read more on Shin splints (medial tibial stress syndrome). Tibia stress fracture is a hairline fracture of the tibia bone caused by overuse, and has symptoms very similar to medial tibial stress syndrome (shin splints), with long-term gradual onset pain on the inside lower part of the shin. The shin may also feel tender to touch and show some signs of swelling. An X-ray may not show up a stress fracture until it has started to heal so they can be difficult to diagnose. If a stress fracture is suspected then treatment involves long term rest of a few weeks, with another X-ray is taken 4 weeks after the first to see if new bone growth over the site of fracture can be seen. Identifying possible causes such as overpronation, training errors is important, as is ensuring the muscles of the lower leg are in good condition with regular massage, stretching and strengthening exercises. Compartment syndrome occurs when the muscle swells up within its surrounding sheath, causing increased pressure and pain. 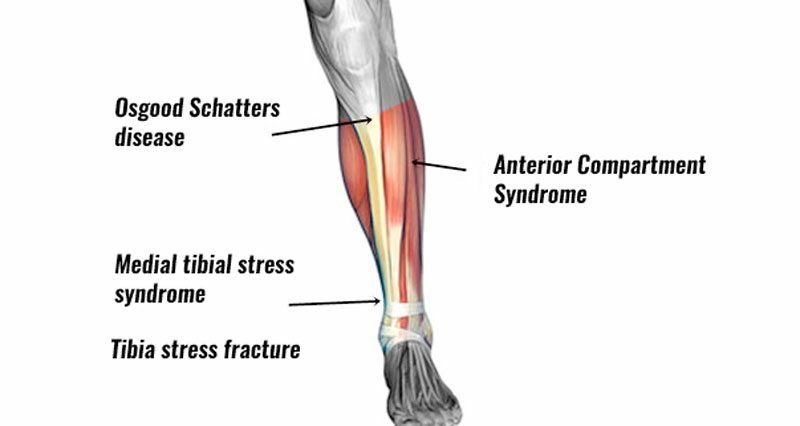 Acute compartment syndrome can develop from direct trauma or impact to the shin. Bleeding of the muscle within the sheath surrounding it occurs, causing increased pressure and pain which can be severe. If pain becomes progressively worse and acute compartment syndrome is suspected, then seek medical attention immediately, as long-term damage can result. With gradual onset or chronic shin pain on the outside of the leg, the large tibialis anterior muscles increase from training and overuse. It will probably be difficult to lift up the foot. When the athlete exercises, it fills with blood and expands causing pain. With rest, the pain eases only to return again when normal training resumes. Treatment may involve longer-term rest, biomechanical analysis, taping, or in some cases, surgery is required to release the sheath allowing the muscle to expand. Read more on Anterior compartment syndrome. Tibia fractures and fibula fractures can occur after an acute trauma or impact. The lower leg is a common area for fractures and can often be broken in contact sports like rugby. A broken leg can take a while to heal, depending on where the fracture is and how clean the break is. DVT (Deep Vein Thrombosis) is a blood clot in a vein that is commonly seen in the calf muscle, particularly following surgery and long-haul flights. Symptoms include constant pain and tenderness at a point deep in the muscle. It essential this is correctly diagnosed as should the blood clot come loose, for example with massage, then it could find its way into the heart and cause death. Popliteal artery entrapment is also more likely to appear as calf pain. However, pain may be felt on the outside of the shin in the anterior compartment or the big muscle on the outside of the shin. There may be a referred pain, where a problem or injury elsewhere causes pain in the shin. It can occur from the spine, from the ankle joint, from a cyst on the knee cartilage or from a Baker’s cyst. A Bakers cyst is a swelling behind the knee and, although this can cause pain down into the shin, it is not particularly common. Osgood Schlatter’s disease is a painful injury of the knee affecting children between the ages of 8 and 15 years old. Pain is felt on the bumpy bit at the top of the shin but may radiate down. Pes anserine bursitis is inflammation of a bursa or sack of fluid on the inside of the knee. Pain is more usually felt on the inside of the knee rather than the shin. Other less common causes of shin pain in the athlete include Femoral endarteritis, Atherosclerotic disease, Proximal tibiofibular subluxation, and dehydration resulting in cramp. The following conditions are very rarely seen as a cause of shin pain, however, a doctor or professional practitioner should be aware of them, particularly if shin pain is persistent or not responding to conventional treatments. These include syphilis, sickle-cell anemia, hyperparathyroidism, sarcoidosis, rickets, Paget’s disease of the bone and erythema nodosum. Tumors of bone and soft tissue are rare, but most likely occur in athletes in their 20’s and 30’s. Osteosarcomata can occur at the ends of the long bones, particularly of the lower leg causing joint pain. Infections such as osteomyelitis or cellulitis may cause pain. The condition can be classed as acute, sub-acute, or chronic depending on the time frame between the initial infection or injury and the bone infection developing. This can be two months or more in chronic cases. Shin pain should be treated using the P.R.I.C.E. principle (protection, rest, ice, compression & elevation). Protection- Prevent the shin from suffering from further damage. Stop training or playing immediately and apply cold therapy and a compression wrap. Rest – Rest is important and vital for recovery. Try to reduce the demands of your daily activity and stop doing any sports that exacerbate the pain. An athlete must know when to stop training and allow the injured area to heal otherwise repetitive minor injuries can often result in a more severe injury that keeps the athlete out for much longer. Ice – Apply ice or cold therapy to the painful area of the shin to help reduce the symptoms of pain and any inflammation. Apply for 10 minutes every hour initially for the first 24 to 48 hours, reducing frequency to 3 or 4 times a day as symptoms improve. Do not apply ice directly to the skin as it may burn. Either wrap ice in a wet tea towel or use a commercially available cold pack. Compression – The use of compression support or compression bandages on the lower leg can help reduce swelling. Elevation – Elevating the lower leg above heart level whenever possible to help reduce swelling due to the effects of gravity.